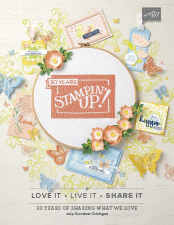 Thanks for joining us on ESAD’s 2016 Holiday Catalogue Blog Hop. I’m brand new to the blogosphere, with this being my first ever blog hop. The lovely Lou talked me into it in a moment of weakness. You may have hopped over to me after seeing Renee’s great projects. Make sure you follow all the links to see everyone’s blogs in this hop. As a virgin blogger I thought I’d keep my first project simple. The first thing on my 2016 Holiday Catalogue wish list was the Santa’s Sleigh Bundle so I’ve created a card using the Santa’s Sleigh Thinlit Dies. I used Whisper White and Soft Sky card stock as my card base then I cut out the sleigh using Silver Foil Sheet. I layered the sleigh with Sweet Sugarplum card stock. If you look really closely you’ll see I’ve added some bling to the Sweet Sugarplum by using some Dazzling Diamonds. I’ve added some Sweet Sugarplum and Silver Glitter Ribbon behind the sentiment and some Fancy Frost Sequins, both from the new Holiday Catalogue. I also embossed the Whisper White card stock with the Softly Falling Embossing Folder. My assistant, Marvi, was on hand for the photo shoot. I’m not sure if he approves going by the look on his face. At least he didn’t destroy my card so maybe it’s not too bad. 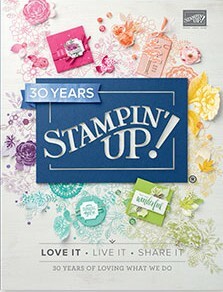 All the cool cat’s have got their paws on the Stampin’ Up! 2016 Holiday Catalogue. Have you got your copy yet? Now it’s time to hop over to Jackie’s blog. Thanks for stopping by.